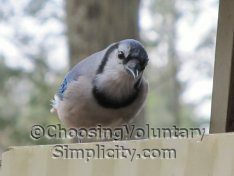 Home » Simple Living / Simply Personal / Voluntary Simplicity » Do I Really Want Another Dishwasher? Do I really want another dishwasher? I don’t know. We have had some miserable luck with our last three dishwashers, with each one being a “more trouble than it’s worth” situation. With the first of these three we were part of a recall but unfortunately a defective motor had caused other expensive problems that the recall would not cover. Our next dishwasher was another beautiful top of the line model. It had all the bells and whistles… and apparently also a lot of defective electrical components. One week past the one year warranty, this dishwasher just stopped working. Again this was an acknowledged defect. And again the defective parts had caused other expensive damage that the recall would not cover. I don’t remember dishwashers before these three being such a continual problem. Did I really just put the dishes in, turn the dishwasher on and not too much later take the dishes out? I also remember sparkling clean dishes… is it just me, or are these energy efficient multi-cycle dishwashers somewhat less efficient and reliable than dishwashers used to be? We’ve had our current dishwasher slightly over two years. It has an unfortunate tendency to just shut itself off in the middle of a cycle for no apparent reason. It started doing this almost immediately after it was installed but the manufacturer insisted that it was nothing to worry about.. that the computer senses when the water temperature isn’t hot enough and shuts everything off as a protective measure. We were told to flip the switch at the circuit breaker when this happens and reset the controls. This does get the dishwasher going (even though the water temperature has not changed)… until the next time the dishwasher shuts itself off again. This shutting off happens several times a week. More recently the dishwasher has started to leak. Not a lot of water, but still enough to make a mess and eventually damage the floor. We had the door gasket replaced and that was supposed to stop the leaking. It didn’t. Then we had the wiper gasket replaced. That was supposed to stop the leaking. It didn’t. It might make more sense if the dishwasher leaked every time it was in use, or if the leak happened at the same point during a specific cycle. It doesn’t. Sometimes a cycle will go all the way through with no leaking at all… sometimes there will be just a few drops of water and sometimes the water gushes forth like it’s coming from a faucet. There are no bad valves, hoses with holes or any other obvious reasons for the leaking and we’re reluctant to sink more money into repairs for a machine that has always had electronic problems. So we have yet another dishwasher that we can’t depend on. When I first realized that the leak probably wasn’t going to be fixed, I was automatically thinking about buying another dishwasher and not liking the idea very much. More recently, I have been wondering if I even want another dishwasher. About the only reason I can think of for wanting one is so it would be available for when I can’t physically stand at the sink long enough to wash dishes by hand. Realistically speaking those times happen more often than I like to admit, and I have had this back injury for enough years to know that these periodic setbacks are part of my life now. Having a dishwasher for those times would help a lot. I actually don’t mind doing dishes and recently I haven’t been using the dishwasher at all. I wash dishes three times a day, using very hot soapy water in one sink and very hot water to rinse in the other. I know all the comparisons insist that dishwashers use less water than washing dishes by hand, but I am positive that my two sink method doesn’t use as much water as the dishwasher does. I’m also much faster! :o) All of our recent dishwashers have had super energy efficient features and the washing process took a really long time… our current dishwasher takes two and a half hours on the pots and pans cycle. I still haven’t decided if I want to try another dishwasher… or not… but a couple of nights ago, I happened to hear the last part of an advertisement for a certain dishwasher model. This dishwasher, the man said, wouldn’t walk your dog or answer your email, but it would get your dishes clean in a reasonable amount of time. I think I might like that. I have never wanted a dishwasher but I inherited one in a flat (apartment) I bought. Frankly it complicated my life! 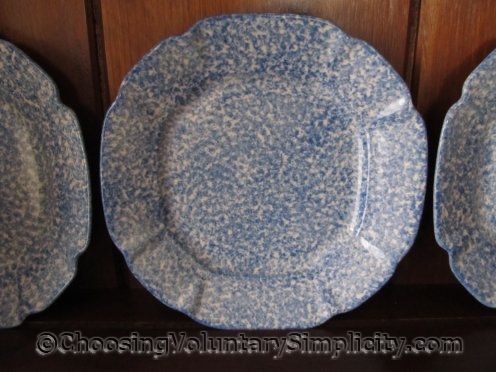 It required special rinse aids, salt etc ( additional expense), was useless for used pans, required stacking up pots for hours to fill it to be used economically. It never got emptied – just used as an additional cupboard! When I moved I left it behind – I now wash at a sink overlooking my garden – mush more satisfying! 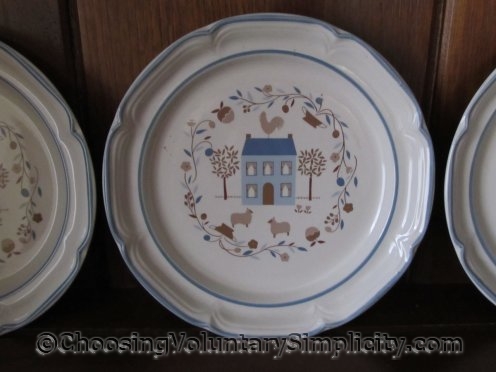 Dishwashers can be great, especially for a large family; however, for someone like me, who lives by myself, it is often just as fast to wash by hand, especially since I have vintage pieces that I refuse to put in the dishwasher for fear of damage. If I am going to wash those by hand, I might as well wash all of it. 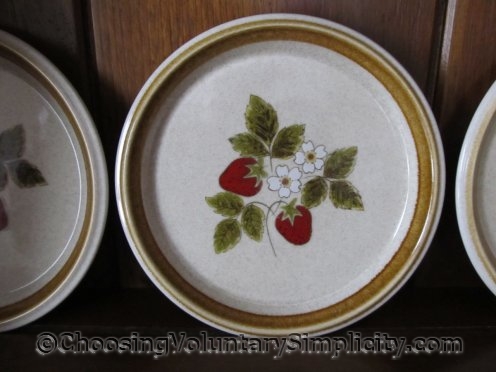 Absolutely love those strawberry plates! Would you mind telling me where you bought them? There are pictures in vintage magazines that show the kitchen sink with just the plumbing underneath, a little swill bucket and a tall stool to sit on. I have always wanted a kitchen that looked like a 1930s model in those pictures. Lino floors, sweet, crisp curtains and a little built-in breakfast nook. Maybe a kitchen sink that you could sit and do the dishes would be a help? I have 3 kids at home still and we use the dishwashers which usually come with our rental homes (hubbies in the military). Would I run out and buy a dishwasher if a home didn’t come with one? NOPE! Usually my teenagers do our dishes and they work together filling and emptying that contraption, it gives them a little time to work together before running off to school work or their jobs. I actually enjoy washing the dishes by hand. I’m reminded of the years I spent standing next to my mom at the kitchen sink. You do want a dishwasher, you really do! Life’s too short to spend time washing dishes by hand. Cooking, working in the garden, watching your chickens having a dust bath, reading a book, even just contemplating all your blessings, yes; washing dishes -no. My husband and I had our Whirlpool Gold fail on us just after our warranty expired earlier this year. We then bought a Frigidaire Gallery dishwasher (model FGID2466QF) from Sears and have been very happy with it so far. Here’s to hoping it lasts more than a year! Good luck with your dishwasher/dishwashing adventures! I love dishwashers and have never had problems with them over my 28 years of home ownership. BUT my current one (bought last year) is energy-efficient. It takes 3 hours 49 minutes to wash and “extra dry” dishes, which still come out wet because it doesn’t have a heating element! Buyer beware, LOL. Had I any notion that this was missing such a major component, I would not have bought it.